I Come across this thread a guys called Shammy overclocked the Geforce GTX 470 GPU to 1170 Mhz and the CUDA to 2340Mhz. Both graphics cards TSMC's 40 nm technology, manufactured with more than three billion transistors and the built version is A3 of the GF100 GPU was stretched around 1170 MHz and CUDA kernels to around 2330 MHz clock frequency, when the graphics bowl was cooled in liquid nitrogen -170 degrees Celsius. 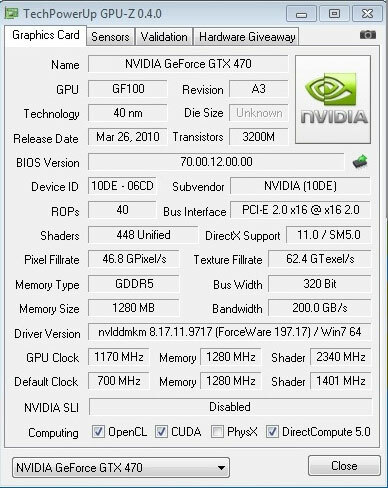 Using Samsung's GDDR5 memory had been put in the GeForce GTX 480 has 1100 MHz, and the GTX 470 has 1280 MHz clock rate.